Everything looks much brighter under the sun of the Empordà and the Gironès regions, their scenery’s contrasts are their attraction, and situated amongst so much beauty is Madremanya. This gorgeous medieval village, built entirely of stone and where time seems to stand still, is home to a small paradise where the most important thing is your guests: El Racó de Madremanya Hotel. Near Costa Brava beaches, golf, horse riding, Dalí route, Girona, … El Racó de Madremanya has preserved the warmth of ancient times, of its stones, of its vaulted ceilings, combines echoes of history with a sophisticated and contemporary style. Boutique hotel with 14 rooms (6 suites) with all the charm of a medieval village and the comfort of impeccable details. Each of its rooms has a different personality and decoration. The garden’s 3000 plus square meters, covered in lush grass, house 2 beautiful swimming pools: one is salt water and the other is freshwater (HEATED from April to October). Wonderful location, great old building, rooms with superb character and great food. This was our first property on this trip and what a great experience, a bit hard to find but certainly worth the effort. Great little quaint village right next door. We only stayed a night. The staff is super nice, the hotel itself is very well decorated and clean. We wish we had stayed longer as this is a great place to forget work and relax. The breakfast is very good. We've been in this lovely hotel for several times know. It is always a pleasure to be there. Every year some changes have been made and the hotel is improved. Josep, Ivan and there staff really care for their guests! What a blissful place. We flew from Leeds Bradford Airport early Friday morning giving us three days and nights to soak up this fabulous hotel before flying back to North Yorkshire on Monday afternoon. The pools, the room, the food, the hospitality was all perfect and I want to return many, many times. This is a great place to spend a few days if you want to get away from it all. 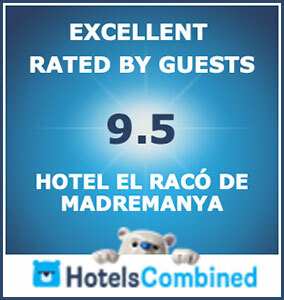 Lovely small hotel with easy access to Girona and the coast. Ivan and the rest of the team were very attentive and full of information about the area. Don't miss the ancient towns of Begur and Paratellada and a trip for lunch to Sa Tuna, Aiguablava and Llafranc are highly recommended. Enjoy!